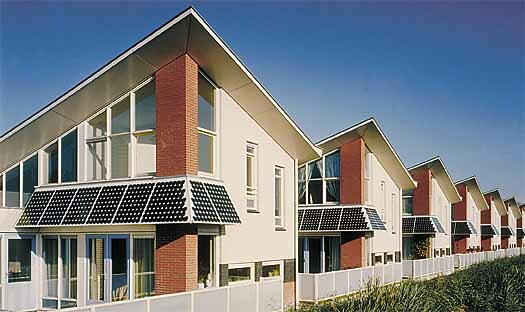 Summary In the Oudelandshoek quarter of Dordrecht, passive solar power and solar pv systems are applied in 22 single houses at the riverside. Furthermore, the houses are provided with a heat pump with integrated ventilation unit. The project is partly financed by the Thermo project of the European Union. The residences are situated parallel to the N3 highway. The fixed sun screen located at the south side of the house is integrated in the façade and provided with solar panels. 8 panels were placed with each house. The goal of this experiment is to gain knowledge on the integration of solar panels in façades during the construction of houses.